Birmingham, Ala. – Mixtroz, a minority and woman-owned tech startup specializing in connecting people at live events in real time, has reached the historic fundraising mark of $1 million. 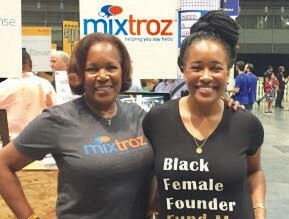 Kerry Schrader and Ashlee Ammons, the founding mother-daughter team behind Mixtroz, have joined the exclusive circle of only 40 black females to close $1 million in seed funding. “Achieving this milestone is a huge success for us, especially considering we are black, female, non-technical tech founders,” comments Kerry Schrader, Mixtroz co-founder, CEO and a former HR executive. “As a startup, Birmingham has proved to be a perfect homebase for us. They have figured out how civic, corporate and tech ecosytems must come together to breed success, and we attribute a lot of our accomplishments to the supportive business community here. Mixtroz is leveraging the secured funding to support the growth and continued evolution of its newly launched SaaS (Software as-a-Service) platform and grow its core team.